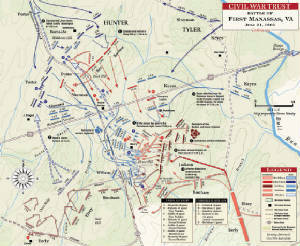 Estimates of numbers of casualties engaged in Civil War battles vary, and statistics on killed, wounded, captured, and missing are incomplete. Participants attempted to fill gaps as they wrote their official reports, and historians have tried to refine the data. The reports of casualties at First Bull Run shown in the Official Records are certainly inaccurate. Figures listed below do not include casualties incurred at Blackburn's Ford on 17 July nor do they show missing-in-action figures for those soldiers who were absent for battle but eventually returned to their units.